Chris K H Teo, Ph.D. I am glad that I have been given this privilege and honour to present my talk this afternoon. Allow me to say thank you to the organisers of this Meeting for their kind invitation and the hospitality extended to me. I am glad too that we all live in the East. Here, herbal medicine is part of our Oriental heritage. So, I am not treading on hostile ground when I talk about traditional medicine even in the meeting of doctors such as this. I am also glad that I am a botanist and am not trained in any curing profession. Hence, I am not confined to any fixed views by having to see things through the same old window. I have the opportunity to seek knowledge and truth based on my own scientific experiences and do things with a difference – after having taught and researched in the university for 26 years. The mission of CA Care is: To carry out our task in good faith and to the very best of our ability, with no regards to material rewards, race, religion or social status. When cancer patients are told that they have no hope and to be prepared for their imminent death, we believe that there is still hope. We subscribe to the principles that: we do not substitute medical doctors, we never promise a cure, and we advocate the healing of the whole person. To help patients attain peace of mind and direction in life after being told that they suffer from cancer. To help patients attain a better quality life. To help patients recover and heal. To foster friendship, care and love for each other. All of those who came to CA Care have already seen their doctors. If they have not seen any doctor before, we request that they see a doctor first and bring us the medical report. On their first visit, we recorded the individual’s medical history and details of the current problems they have. These data establish the baseline for evaluation of their progress later. Table 2 shows that most patients have already undergone either surgery, chemotherapy or radiotherapy, or a combination of therapies before they came to see us. Unfortunately, among those who came, 36% (n=252) have been medically written off or did not know what else to do. 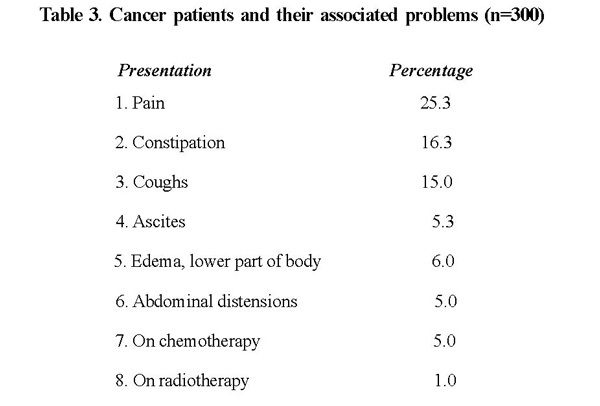 Apart from the cancer, patients have other associated problems that make life extremely miserable to many of them. They presented us with pains, constipation, coughs, ascites, edema and abdominal distensions. 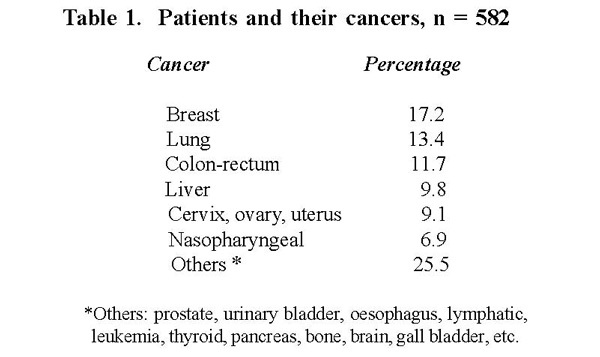 Some were suffering from the side effects of chemotherapy or radiotherapy (Table 3). We spend time with patients advising and prodding them to change their lifestyle and letting go of their emotional problems. Belief in God plus the full-hearted care, love and understanding from family members – spouse, children and relatives are equally important requirements for healing. The strategies of healing by using herbs are: to counteract the effects of toxins produced by the diseased tissues, detoxify the body system and boost its immune system. The emphasis is to restore balance in the body that has for years been in serious disharmony. The herbs do not in any aggressive way attempt to destroy the malignant cells unlike the chemo-drugs or radiation. 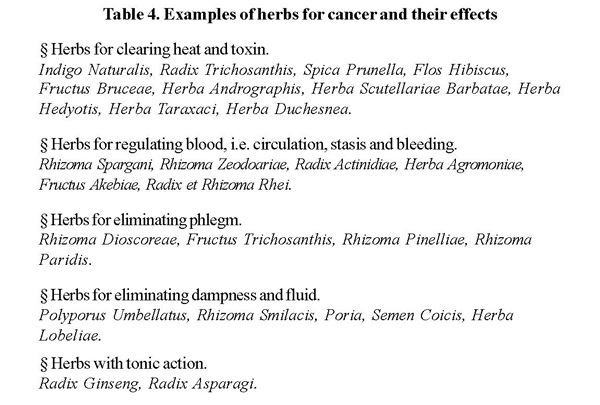 There are at least 250 types of herbs in the Chinese Pharmacopoeia that are said to be good for cancer patients and examples of some of them and their effects are listed in Table 4. Based on both written and practical knowledge we have formulated no less than 60 herbal mixtures to help cancer patients with their problems (note: as of 2013, we have formulated more than 200 types of herbal teas). These herbal combinations are made from herbs imported from China or grown locally in our farm. They are purely herbs as we do not add any preservatives or chemicals to them. It is the standard scientific practice that one should be able to measure, predict and reproduce any claim of effectiveness. A symptom that cannot be measured or seen through the high tech machine is considered to be fake and non-existent – it is all in the head. Unfortunately, those involved in healing do not subscribe to this notion. Herbert Benson, professor of medicine at Harvard University wrote: My research has demonstrated that…it is impossible to separate objective and subjective changes….we have distrusted a patient’s ability to perceive authentic bodily change. According to Jeffrey Tobias, Clinical Director of the Meyerstein Institute of Oncology, UK., … the individual patient’s story, represents the lowest level (of evidence) … it is not that they are untrue, but simply that they can’t be representative of any general truth. It must be emphasised that anecdotal material is not statistical, but it is true. Bernard Siegel, a neurosurgeon and professor at Yale University wrote: if a miracle such as remission of cancer, happens once, it is valid and must not be dismissed as a fluke. If one patient can do it, there’s no reason others can’t. I have realized that medicine has been studying its failures when it should have been learning from its success. 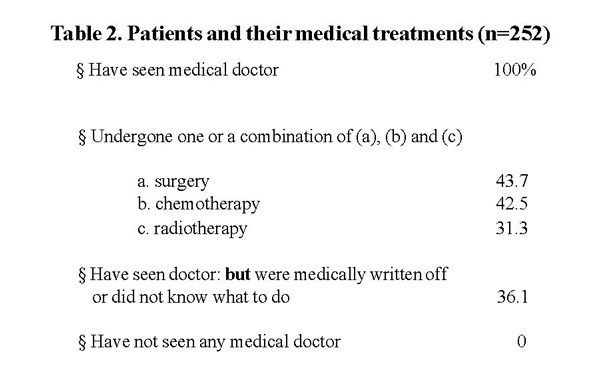 Patients with file numbers from A1 to A 100 were studied. Thirty of them had pains and were prescribed Pain Tea; 19 had constipation and 16 had coughs and were prescribed herbs accordingly. The benefits derived from taking these teas are shown in Table 6. 1. Breast-Bone CA. Pain throughout whole body, on morphine every four hours. After taking Pain Tea no more pains, except at waist. Stopped morphine completely. 2. Lung-Brain CA. Pains in the leg. No more pains after taking Pain Tea. 3. Throat CA. Tube through nose. Pains in throat. After Pain Tea pains lessened. 4. Liver CA. Abdominal pains all the time. Pains very much reduced after Pain Tea. 1. Throat CA. Sticky white phlegm. No more coughs after taking Cough 5. 1 and coughs stopped after two weeks on herbs. 3. Lung CA. Itchy coughs. No more coughs after taking Cough 11. 4. Breast-Bone CA. Coughs throughout day. Yellow phlegm. Coughs improved after taking Cough 3 and became white phlegm. 1. Breast-Lung-Liver CA. Difficult, goat’s stools. No more constipation after Constipation Tea. 2. Bone CA. Very dry stools. No more constipation. 3. Kidney CA. Bowel movement once a week. No more constipation after Constipation Tea. Full Round of Golf after Chemotherapy! General Datuk Y had lung cancer. He had chemotherapy in a London hospital. He took herbs and Chemo Tea with the full blessing of his oncologist. He did not suffer any side effects throughout the course of the treatments. He could play a full round of golf even after the chemo-treatment. There was no hair loss or vomiting. No Need for Radiation after Herbs and Lunch after Chemotherapy! CLM was a 43-year-old female. She had colon cancer that had metastasised to the ovary. She was unable to walk, had no bowel movements and had difficulty urinating. Her doctor scheduled her for both radiation and chemotherapy. After two weeks on the herbs, her conditions improved and the doctor decided not to give any radiation at all. She later had chemotherapy and was on Chemo Tea. She did not suffer any side effects and was able to eat immediately after each chemo-treatment. 1. Cervix-Lung CA, 49-year-old female. During the first two chemotherapy sessions she suffered grogginess, hair loss, vomiting, diarrhoea, numbness in hands and legs. On Chemo Tea from 3rd to 6th chemotherapy – no problem. Went home, could do housework. 2. NPC- Lung CA, 33-year-old male. Had pulling pains in the chest. Needed to sleep for two days after each chemo-treatment. On Chemo Tea for subsequent treatments, she was not tired and had no more pains. 3. Breast CA, 39-year-old female. Vomited for two to seven days after each chemotherapy session. On Chemo Tea, condition improved. 4. Histiocytoma, 56-year-old female. She started off with Chemo Tea while on chemotherapy. She was better off than other patients. 5. Breast CA, 50-year-old female. On Chemo Tea from beginning. No vomiting. Good appetite and put on weight. 6. Malignant carcinoid-Liver, 46-yer-old male. On Chemo Tea. Suffered minimal side effects. Returned to Australia. 7. Breast CA, 47-year-old female. The first two chemotherapy sessions without herbs. On Chemo Tea – from third sessions onwards. Felt better and had more strength. 8. Breast-Bone Recurrence, 37-year-old female. On Taxol – fingernails turned grey, hands trembled. On Chemo Tea. She had good appetite. Herbs helped her compared to earlier rounds of chemotherapy when she was not on herbs and suffered badly. It is not possible for me to present the percentage of cure by the CA Care Therapy. We were only able to record the patients’ responses based on what they told us or the medical reports brought in by the patients. Ideally, we would have wanted to be able to monitor the progress of their healings with the co-operation of their doctors. Unfortunately, the time and era for such co-operation are still not at hand. We are also in no position to do proper large scale clinical trials, for such responsibility is for those who have the financial resources and expertise. However, we have witnessed enough cases of cancer healing to demonstrate the benefits of herbs to cancer patients. The healing we have observed are real and they are not fluke shots or fakes. These are not isolated cases either. In many instances they can be repeated. As a botanist specialised in tissue culture, I do not see why we cannot clone or mass-propagate such outstanding healing. To my mind, it is a problem of a non-receptive mindset rather than the science itself. Also, as a scientist, I always adopt a pragmatic view and accept that the patient has a doctor within himself. And that, when he feels well, he knows he is well. Of course, it would be ideal if the tumour in a cancer patient disappears. In the quest to achieve our goal, it is worthy to remember two tenets of Chinese wisdom. One, do we drain the pond to catch the fish? Simply put, do the toxic drugs kill the person rather than the sickness or cancer itself? Two, Taziano Terzani wrote: The Chinese – like almost all Asians – have never pondered the problem of defining what is and what is not science. For centuries, the Chinese have practised (their medicine) without ever wondering if its base was scientific. In their eyes, it works and that was enough. As a scientist, I always hold that the inability to explain a phenomenon is no excuse for rejection of the truth. This inability merely reflects our limitations and inadequacy of knowledge. Science cannot explain all life’s phenomena – even the simplest of phenomena is not fully understood! We have recorded the patients’ responses as honestly as we can without exaggerations. Table 7 shows the general response of patients to our therapy. Almost 40 percent of the patients who came to us benefited in one way or another. The rest, for reasons only known to themselves, stopped the therapy after the first or second visits. However, from experience, those who persisted after four weeks on the herbs reported beneficial responses. I have summarised some anecdotal evidences of healing. It is up to each individual to accept or reject these stories. However, we know one thing: the cancer patients and their families have often expressed their satisfaction and happiness for whatever benefits they obtained, regardless of whether or not such healing is considered scientific. To ensure that cancer patients do not lose precious time on non-effective therapy, we have also advised them to stop taking our herbs if after two or three weeks, they do not experience any improvement to their overall well-being. In addition, we do not discourage or ask patients to stop taking their doctors’ medication. Herbs can be taken half an hour before or after taking other drugs. Chi was a female of 69 years old. She had undergone an open-and-close operation and the medical report of 28 December 1999 indicated: secondary malignancy in abdomen with extensive metastasis. Primary site ???. The surgeon repeatedly told the family not to expect any more hope. The children cried in despair and the husband almost fainted. After one week on the herbs she felt more cheng sin (alert with strength). After three weeks she could go marketing. We are not able to cure the incurable but we were able to put a smile on her sweet face! The family rejoiced for this blessing. VR was a 69-year-old female. She suffered from cervical cancer stage 3B. She was given 24 radiation treatments that resulted in very bad side effects. She was unable to walk. The medical report stated: had heart failure, thus most of the time bed-ridden and in wheel chair at most. Her condition improved after 10 days on the herbs. After two months she returned to her hometown very much alive! Francis was a male of 65 years old. He had advanced stomach cancer and did a by-pass in Singapore. His doctor told the family that he has only one to three months to live. After four months on the herbs, he came to CA Care and told us that his grey hair had turned darker because of the herbs. On 25 February 2000 (six months after the operation), Francis died of, not of cancer. AS was a male of 67 years old. He had colon cancer that spread to his liver. His doctor asked him to go home and count his days. The prognosis was extremely poor and neither chemotherapy nor radiation would be of any benefit. There was no medicine for him either. After two weeks on the herbs AS begun to live again. AS led a quality life for a year and seven months and the CEA level decreased from the initial 45.2 to 5.0. Unfortunately, family circumstances changed and AS had a relapse soon after that. The CEA again increased to 34.8. For six months, AS led a painful life having to undergo medical treatments in the hospital where he died. Ai was a female of 38 years old. She had breast cancer that had metastasised to the liver. On 2 November 1999, she was on four hourly doses of morphine. She was constipated, had a distended stomach and could only swallow three to four spoonfuls of food. After four days on the herbs she was morphine-free; on the fifth day, her appetite improved and she had regular bowel movements. On the tenth day, she could join the family for meals. On the fourteenth day, she was in the wheelchair collecting the keys of her new HDB flat. After twenty days on the herbs she could talk a lot. Then she was in Johor Baru walking around with her husband – without a wheelchair. The effort of one botanist cannot go beyond pointing the direction to where future research should go and alerting the scientific community to greater possibilities. Learned brains would do well to remember what Albert Einstein said: if at first the idea is not absurd then there is no hope for it. However, a study of medical history has often shown that too often good ideas are condemned, especially if such discoveries do not have the potential to generate tremendous profits for vested interests. Dr. Ignaz Semmelweiss died in a mental hospital for challenging the establishment and insisting on the need to wash hands after carrying out any autopsy. Dr. Cornelis Moerman was deregistered and prosecuted for treating cancer patients using his non-drug, diet therapy. It was only fifty years later that the Netherlands Ministry of Health vindicated him and granted approval for the practice of the Moerman Therapy in that country. Science moves but at a very, very slow pace! While the herbs that could have cured them grow on their graves.